The photo features a woman walking down a trail on the Atlanta Beltline during a bright spring day. She's surrounded by other walkers and bike riders, and she's carrying her groceries home. 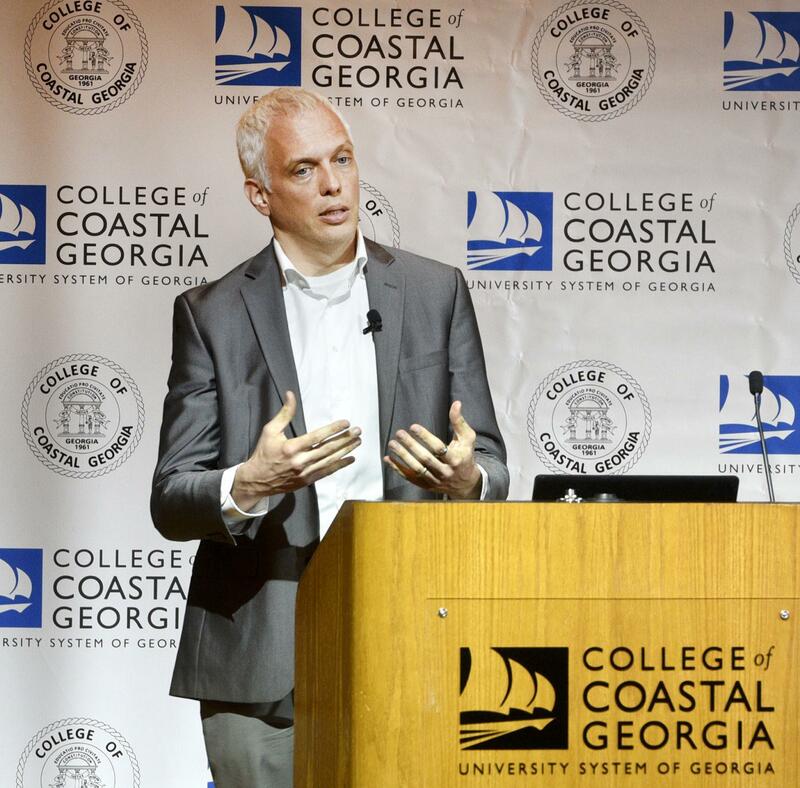 Ryan Gravel, who took the picture several years ago, showed it to audience members Thursday evening at the inaugural 2019 Distinguished Speakers Series hosted by the College of Coastal Georgia Foundation. He said it's his favorite photo he's taken of the BeltLine after about 15 years working on the project. "She's validating everything that we always said the BeltLine could do," Gravel said. "It's making a way of life possible that wasn't possible before." Gravel, an urban planner, designer and author, shared the story of the creation of the Atlanta BeltLine. Gravel envisioned the project in his graduate thesis in 1999 and has since helped bring the project to life while sharing its story with communities around the world. The BeltLine is a 22-mile transit greenway that is changing both the physical form of Atlanta and the way of life for many of the city's residents. The idea was to reclaim the loop of old railroads that circle downtown and midtown Atlanta and repurpose them into a different type of infrastructure. In doing so, the new infrastructure could revitalize neighborhoods and incentive redevelopment. "I never imagined we would actually build it," Gravel said. "I just wanted to graduate, which I did." The talk on Thursday, which included an on-stage interview with Bert Roughton, a former senior managing editor at the Atlanta Journal-Constitution, created a buzz around the community, and attendees filled most seats in the college's Southeast Georgia Conference Center. "This is our purpose for the speaker series — it's to encourage conversation, thoughts, questions," said Michelle Johnston, president of the college. "So, it's working." As an architecture student at Georgia Tech in the early 1990s, Gravel spent a year abroad in Paris, France. During his time there, he lost 15 pounds in the first month from walking as a main mode of transportation and eating healthy fresh food inside the city. "The role of the physical city around me was shaping my own health and well-being," he said. "... It got me really obsessed with the design of cities, specifically the role of infrastructure in shaping our lives." He returned home and soon started a job that required him to drive Interstate 285 every day, spending hours surrounded by thousands of people but isolated and immobile in his car. That wasn't the life he wanted, and Gravel dreamed of ways to transform Atlanta. That led to his graduate school thesis, and after graduating Gravel began to introduce the idea to the city's leaders. Neighborhoods quickly fell in love with the proposal and took ownership of the project, which Gravel said was a major contributor to its ultimate success. "We created this massive grassroots movement of people in support of this vision for their future, without any official plan," he said. Gravel also wrote a book, "Where We Want to Live," that connects the story of the BeltLine to what's happening in cities around the world. "We are in the beginnings of a really radical transformation in the way that we build the cities around us, in the way that we live our lives," he said. "And we're just starting to see the beginnings of those conversations." The conversation about how to revitalize an area is familiar in Brunswick, where community members wish to bring more life to downtown and other parts of the city. The BeltLine has also led to a cultural transformation of Atlanta, Gravel said. The transit greenway has created a social space where communities that were once separated by railroad can come together. The project also aims to improve the lives of those in low-income areas of the city. This kind of change can be made in a community of any size, Gravel said, as long as the people who will be a part of the transformation take ownership of the idea. "The idea is one thing, but doing it is another," he said. "That really gets down to all of you participating in it and, like the BeltLine, believing in a vision for your future, and then empowering the elected officials and everybody else to pull it off." Republished with permission of The Brunswick News. Originally published at The Brunswick News.